Arrowhead Martial Arts Academy is a Martial Arts School offering Jiu-Jitsu (Jujutsu/Jujitsu), Kick Boxing & Tae Kwon Do classes in Glendale, AZ for kids, men and women. Arrowhead Martial Arts Academy is Located at 20165 N 67th. View a Location Map, get Directions, Contact Arrowhead Martial Arts Academy or view program details below. 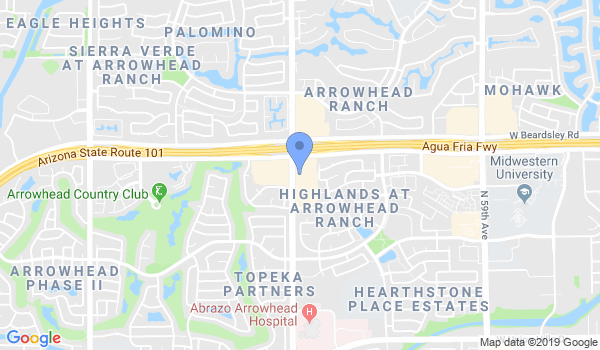 If you are a student at this school, help your local Martial Arts Community by writing a Review of Arrowhead Martial Arts Academy. You can also help your school by sharing it on Facebook, Twitter, Google+, Pinterest etc. At Arrowhead Martial Arts Academy we teach the art of transforming lives through the venue of martial arts. Through our “Six Tasks” Character Development Program, our students are taken on a journey to change their behavior outside the academy, as well as, inside. Since our foundation starts with respect, every student is sent on a mission to record 50 acts of kindness, courtesy and respect. These acts are recorded in their respect journal, two a day, until they have completed 50. Since it takes 21 days to make a new habit, upon completion of this journal, our students have now become aware of what it means to be respectful. By taking action, they have learned by doing; which earns them their first badge--respect. Respect is the first of six journals to be completed--teamwork, self-discipline, perseverance, leadership and knowledge are to follow. Would you like more information on hours, classes and programs available at Arrowhead Martial Arts Academy? Please contact the school with your questions. Update the details, Write a Review or Report Error of Arrowhead Martial Arts Academy.